Innovation promotes sustainability. Our confidence in this belief has compelled us to tailor our growth strategy around innovation. We, at Organik Kimya, have adopted a holistic innovation approach: From research and development to manufacturing and business process operations, we progressively work to insure innovative ideas are cultivated and implemented. We have incorporated innovation to what we do in our everyday lives at Organik Kimya. We evaluate ideas at monthly held Innovation and Business Process Management (BPM) Board Meetings. We utilize a systematic yet flexible stage gate process from idea to commercialization. 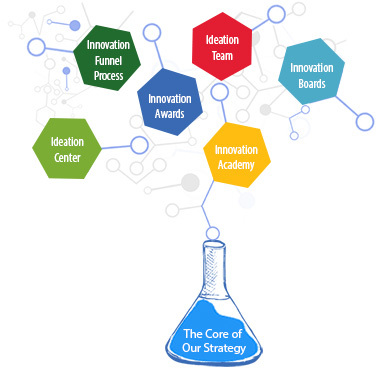 Our Innovation Academy creates synergy across functions and business segments making sure our holistic approach to innovation is live. We reward innovative ideas with Organik Kimya Innovation Awards. The Ideation Room is a place where we read, research, ideate and share our ideas with each other. We believe that the best ideas are derived from the ones that are built on top of others. We recognize that the best of ideas originate from various sources. For this reason, we create strong partnerships with the industry, research institutions and universities. Partnering with our customers to understand them and developing sustainable solutions constitute the basis of our Research & Development philosophy. We invest 3% of our turnover to R&D and our centralized, state of the art Research & Development Center is the only accredited R&D Center by the Ministry of Industry in the specialty chemicals industry in Turkey. Our scientists synthesize, apply, scale up and analyze every day in industry-dedicated laboratories to help deliver smart solutions for our customers. Our cutting edge testing and measurement equipments provide results in various standards including, but not limited to ISO, ASTM, DIN, PSTC and FINAT. From polymer emulsions and redispersible powder polymers to hotmelt technology, we synergize the know-how and expertise of our technical teams.